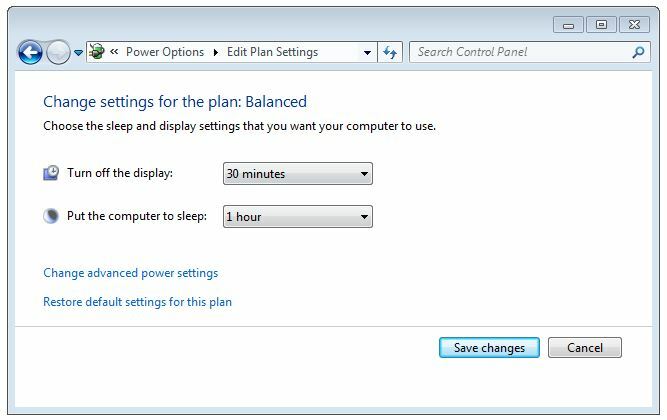 To view your computer sleep settings, open the Control Panel. The Control Panel can be found in the start menu on any version of Windows, or type "control panel" in search from the start button. 1. Once in the control panel, go to the power options group. The groups should be in alphabetical order, but if not, use the search bar in the upper right hand corner and type in "power options". 2. Once you open the power options dialog, on the left side of the windows there will be a "Change when the computer sleeps" link. Click that link. 3. This will bring up the "Edit Plan Settings" options window for your computer's default plan. * It is recommended that users set "Turn off the display" to 30 minutes of non-use and "Put the computer to sleep" to (1) hour of non-use, up to no more then (5) hours. 4. You can also access these settings from the Screen Saver Settings window. From Windows 7, right-click on the Desktop and choose "Personalize". Then choose "Screen Saver" in the lower right corner, and then "Change power settings". ​From Windows 10, right click on the Desktop and choose "Peronsalize". Then choose "Themes" and "Theme Settings". There you will find "Screen Saver" and the "Change power settings" link. How is Student Printing handled at Viterbo?